Organic Silk Dragon Jasmine is the third rainbow tin I purchased when DavidsTea had the buy-2-get-1-free promotion (the former being Cream of Earl Grey and Birthday Cake). I picked this one because I knew I loved jasmine green teas, so how could I go wrong? Organic Silk Dragon Jasmine comes in a sturdy metal tin in a bright almost green grass kind of colour. The tea itself comes in a resealable bag, which I greatly appreciate. The leaves themselves aren’t very large, but are decently sized enough that it isn’t like the tea leaf dust that comes in some prepared tea bags. It smells amazing though, there’s quite a strong jasmine scent to the tea, but it is overpowering and I can definitely still make out the tea smell. This tea has the following ingredients: Chinese green tea from Jiangxi and Fujian Provinces, scented with jasmine flowers. Additionally, the tin boasts that the tea is fair trade certified, USDA organic and Canada organic – just in case you missed the word ‘organic’ in the name of the tea itself. For preparing this tea, DavidsTea recommends using water that is 80C (176F) and to steep for 2-3 minutes. I opted to steep around 2 minutes. The jasmine scene is beautiful when the tea is steeping, and when the tea leaves are removed. There is something distinctly floral about this tea, as one might expect from a jasmine green tea. 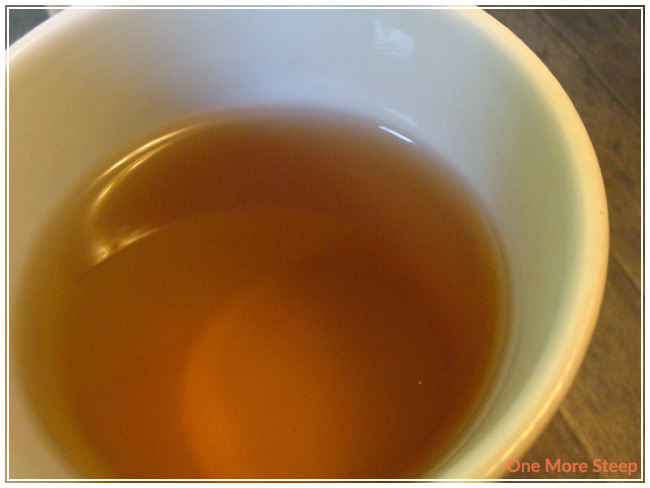 The tea itself steeps to a yellow-brown colour. 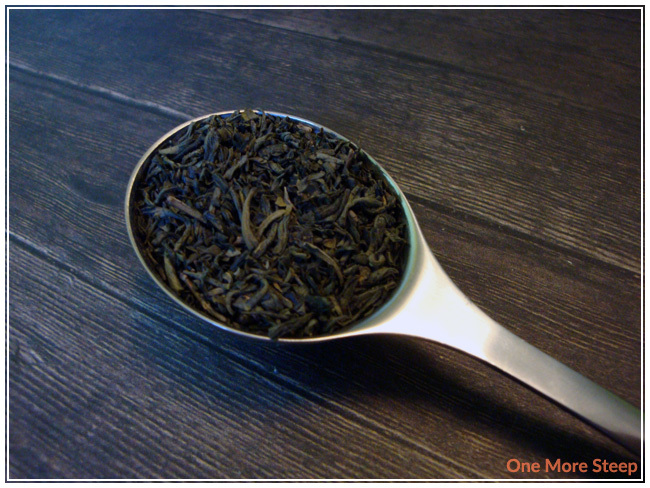 The flavour of Organic Silk Dragon Jasmine is quite good, it’s a very smooth tea and I noticed no bitter taste to it. Green teas in general often run the risk of being better if steeped for too long or steeped in water that is too hot – all that bitterness is sure to ruin a cup! Luckily, I watched the clock for this one and I really enjoy it. Because it is a straight tea, I’m looking forward to trying it for one more steep! Organic Silk Dragon Jasmine does not disappoint on steep #2. I would even say it tastes better for cup two than it does for cup one! The flavor is a lot more smoother, and there’s even a light sweetness to the tea that wasn’t there before. It also does quite well for steeps three and four. 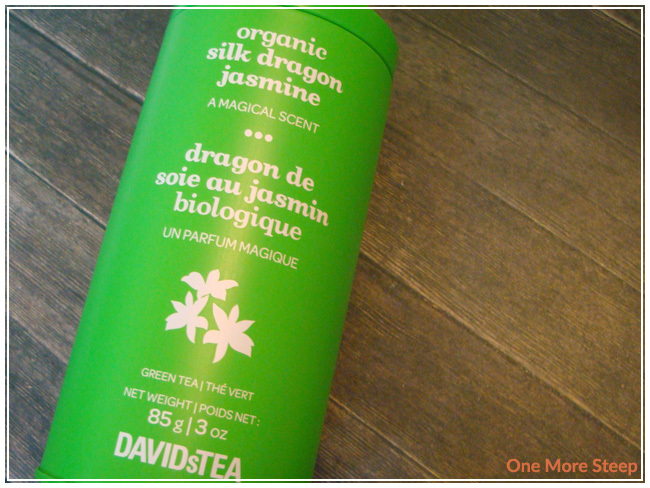 I loved DavidsTea’s Organic Silk Dragon Jasmine. It’s not an overly complex tea, but that is what makes it a good tea. It does well when resteeping, the flavour improves, and it’s tasty. While I do love it (and will likely restock my tin when it empties), it is not economical compared to other jasmine green teas. For instance, this tea is $10 for 85g (or $7.75 for 50g if buying loose) when the first tea I reviewed for One More Steep was for Stassen’s Jasmine Green Tea that was $6 for 150g. In my opinion, the quality of the tea is definitely higher for DavidsTea’s Organic Silk Dragon Jasmine, but is it 3x the quality? That’s a little bit more iffy. I love my teas, but it is a bit of a luxury to afford pricier teas. I do really love the Organic Silk Dragon Jasmine though, and I do believe that it resteeps a lot better than Stassen’s.